Got a whole box of these clothing tags a while back from a local packaging store and since my motto for the year is to use more of what I have, I made these tags to include in the new travel kit. 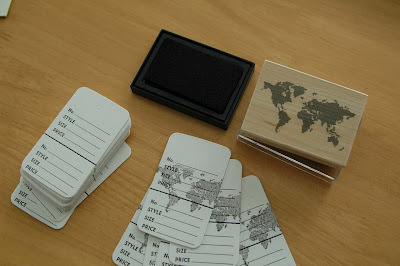 Found this stamp of a world map on Etsy here. Love how the image is not solid but "griddy" so it doesn't sop up a bunch of ink and it stamps a lighter colour. Ink is black but it ends up being a bit grayish (partially because of the stamp and partially bc of the ink too). More handwriting to complete the tag. I included about 6 inches of black/white baker's twine in the kits so that you can tie it to this tag and use it in your book:). Nice! I like the new tags! 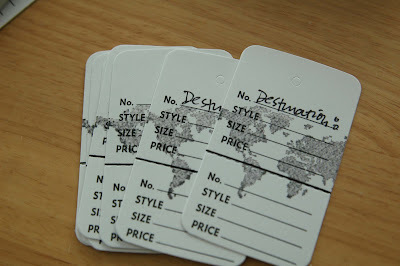 I LOVE the idea of using the clothing tags! The map stamps look great on them!